Having diabetes won't stop you from building muscle. However, it's wise to follow a few precautions when it comes to gaining muscle. 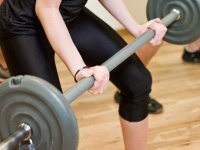 There are many different types of exercise and one of the most popular is strength or power training, which is very effective for building strong bones and muscles. Strong muscles collect oxygen and nutrients from the blood much more efficiently than weak ones, meaning that any physical activity you do will require less cardiac work and put less strain on your heart. As well as being good for the heart, they also improve weight control and help the body remain sensitive to the hormone insulin, which is vital for keeping blood sugar levels in check and preventing or controlling type 2 diabetes. Protein intake is vital for building muscle. However, your body constantly drains its protein reserves for other uses such as producing hormones, resulting in less protein available for muscle building. To counteract this, you need to build and store new proteins faster than your body breaks down old proteins. You should look to consume about 1 gram of protein per pound of body weight, which is roughly the maximum amount your body can use in a day. Remember, the more protein your body stores (protein synthesis), the larger your muscles grow. Protein shakes are very effective for improving strength. While many trainers have a post-workout shake, research has shown that drinking a shake containing at least 6 grams of amino acids - the muscle-building blocks of protein - and 35 grams of carbohydrates 30-60 minutes before exercising increases your protein synthesis more than drinking the same shake after training. "Since exercise increases bloodflow to your working tissues, drinking a carbohydrate-protein mixture before your workout may lead to greater uptake of the amino acids in your muscles," says Kevin Tipton, PhD, an exercise and nutrition researcher at the University of Texas. Good quality whey-protein powders usually contain at least 30 grams of protein per serving, as well as a healthy supply of vitamins and minerals. Other liquid supplements such as weight-gain powders can also provide a lot of high quality protein and nutrients in each serving, but they also tend to be extremely high in calories, carbohydrates and sugar. While this is sufficient for most weight lifters, it is not ideal for those with conditions such as type 2 diabetes, for whom weight loss may be a key goal. If you're new to weight lifting or strength training, just about any workout will be intense enough to increase protein synthesis and build muscle. Building toned muscles with type 1? However, if you're experienced with weights, you'll see the biggest and fastest results by focusing on the large muscle groups, like the back, legs and chest. The best exercises for these body parts are squats, dead-lifts, bench press, leg press, pull-ups, bent-over rows, shoulder press and dips. Add two or three sets of 8 or 12 repetitions to your workout, with about 60 seconds' rest between sets. Post-workout meals or snacks should be high in carbohydrates and protein. Carbohydrates are needed to fuel exercise. As well as being a vital energy source they also play a role in the release of insulin, which regulates levels of blood sugar and is also the body’s most potent anabolic hormone. However, people with diabetes are generally advised to limit their carb intake to keep their blood sugar levels under control as their bodies struggle to produce insulin or don’t use the insulin produced effectively. The problem with this though is that a lack of stored carbs can result in the body using protein for energy production, thus leaving less protein for building muscle. The key is to cut out bad carbs such as. refined, processed carbohydrates found in white bread, potatoes, pasta and rice from your diet and replace them with good, unprocessed carbs from fruit and vegetables, beans, nuts, seeds and whole-grain versions of bread, pasta and rice. Foods with good carbs generally have a lower glycemic index (GI), which means they tend to break down slowly to form glucose. Low GI foods also have a high nutritional value and provide prolonged release of energy. Adequate water consumption is one of the most overlooked factors in exercise. Water comprises up to 70% of the human body and if you're dehydrated, your muscle size suffers as well. The other way of looking at it is that one pound of muscle can hold up to three pounds of water. Rest is another hugely overlooked factor in building strong, lean muscle. The simple fact is that after an intense workout, the body needs the proper nutrients and recovery time to grow bigger and stronger. In fact, your muscles grow when you're resting, not when you're working out. If you’re a beginner, do a full-body workout followed by a day of rest. Alternatively look at setting aside at least 3 days of rest each week. A common misconception among the general public is that all types of fat are bad for you. While saturated fats and trans fats (i.e. bad fats) increase cholesterol and your risk of certain diseases, monounsaturated fats and polyunsaturated fats can have the opposite effect and benefit your overall physical and mental health. They are also important for muscle growth.